Located only seven miles south of Edinburgh’s city center, there are multiple ways to travel to this beautiful historic site. Car — The Chapel is located within the village of Roslin, just off the A701. There are brown tourist signposts to direct you as you approach the village. There is free parking at the Chapel. Bus — Buses run from Edinburgh every day to and from Roslin village. Look for a Lothian Service 37 bus that says ‘Penicuik/ Deanburn’ at the front. The trip will take around 45 to 60 minutes and will cost around £1.70 per adult. 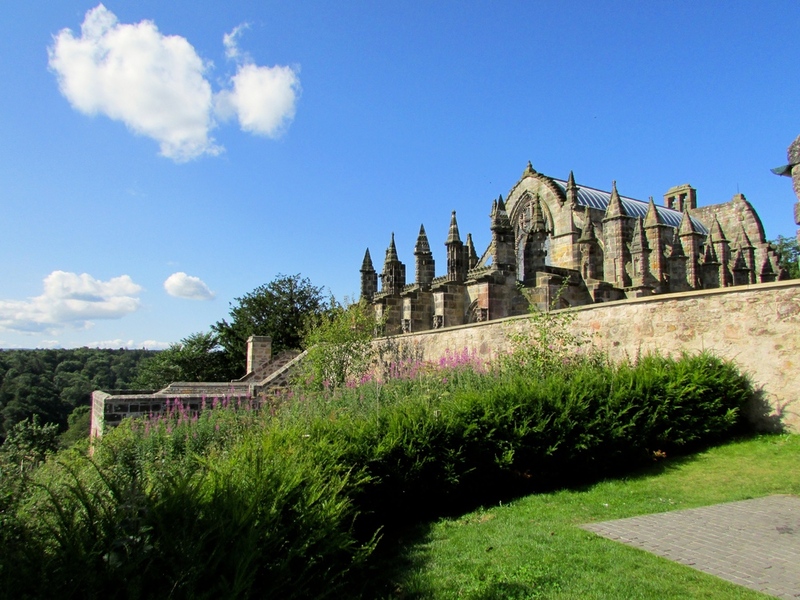 Visit the Rosslyn Chapel website for more travel options. The Chapel is open every day except December 24, 25 and 31, and January 1. It takes about one to two hours to explore the chapel, ground, and visitor center (allow for more if you want to spend time in the coffee shop), so you should make sure you don't visit too close to closing time. Admission for adults is £9.00. Children are free if they are part of a family group. It is important to note (and this may come as a disappointment for some) that there is no photography or video allowed inside Rosslyn Chapel. You can take as many photos as you would like of the exterior, however. Make sure you make time for the coffee shop! Located in the visitor center, the coffee shop has spectacular views of the Scottish countryside. On a warm day, you can sit out on the sunny terrace, or stay cozy and enjoy the view from the modern dining space. The food is fantastic — expect things like soups, sandwiches, scones, cakes, and more, all created using local ingredients. After wandering through the modern visitor center, you will find yourself inside the thick stone walls of the church grounds. The building itself is oddly multi-colored and the carvings along the outside are eerie and covered in cobwebs. The interior of the church overloads the senses with all of its textures and carvings. Don't forget to look up — the ceiling is spectacular! The chapel was built in the mid-15th century for William St Clair, the third Earl of Orkney, and what sets it apart from other churches created at the time is the ornately carved interior. While there are the expected biblical figures, angels, vines and flowers, the architecture is also full of mason symbolic imagery. The fact that all of these symbols are found in one place has led some researchers to believe that Rosslyn is some sort of secret Templar repository or meeting place and that hidden vaults beneath the chapel could contain anything from the Holy Grail (Dan Brown clearly knew his history) to the body of Christ himself! The chapel's appearance in The Da Vinci Code has only fuelled the conspiracy theorists, and the once sleepy chapel has now become a major tourist destination.